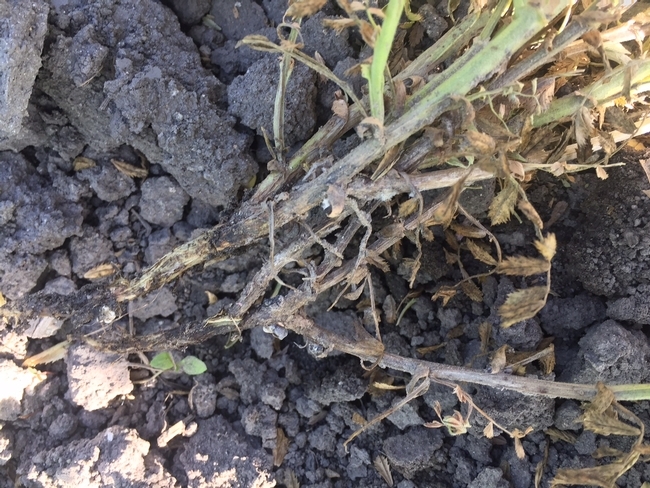 White mold in garbanzos often infects the plant stems near the soil line. 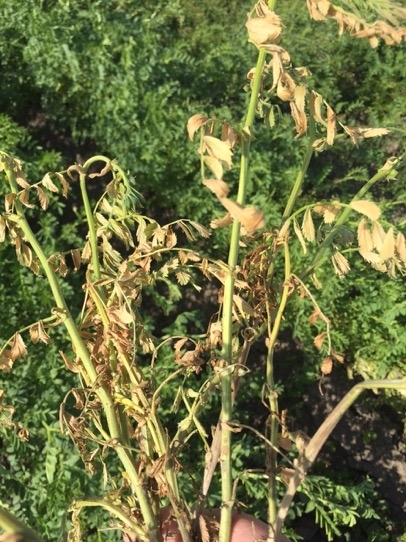 Our cool, wet conditions are favoring white mold (sclerotinia) in garbanzo beans this year. This disease is characterized by a white fungal growth that attacks the above ground plant parts, often near the soil line for garbanzos. The affected tissue dries quickly and bleaches to a pale tan or almost white color. Black sclerotia formed on the stem of dying plants are often visible. These are masses of fungi compacted to form small, dark pellets that range in size from 1-8 mm (about the tip of a pencil to a pencil-size eraser) that allow the fungus to survive in adverse conditions (e.g. hot, dry weather). When the main stem is affected near the soil line, the entire plant wilts and dies; lesser infections will show dead branches, causing yellow flagging in the field. White mold in garbanzos causes yellow flagging in the field. The black sclerotia pellets formed in the mold can survive many years in the soil and re-infect crops. The development of white mold is greatly influenced by prevailing weather conditions and certain agronomic practices such as late extensive irrigation, plant density, and plant growth characteristics, which are all closely linked with the life cycle of the pathogen. A thick dense plant growth provides a micro climate of cooler temperatures and high moisture beneath the plant canopy where conditions are favorable for disease. The best control focuses on cultural practices to prevent the disease from developing in the field. This includes higher beds that keep lower plant parts and tops of the bed drier, wider row spacing to increase air movement in the canopy to keep the foliage drier, and planting garbanzo beans later (December through early February) rather than early (November) since the extra growing time can result in heavy canopies that increase humidity and cause infestations late winter/early spring (favorable disease conditions, 68oF-77oF). Crop rotation generally does not prevent white mold infection due to the broad host range of the pathogen. Fungicides are available for white mold control, but getting good coverage and control is difficult because the inoculum is in the soil and the disease is often deep in the plant canopy. Fungicides would have to be applied when plants are smaller to provide good coverage and protection from this disease. For a list of fungicides available for white mold control in in garbanzos, see http://ipm.ucanr.edu/PMG/r52100111.html.